Took our leisure getting going on Tuesday morning. It was very cold and none of us had slept very well. Mike and Barbara’s dirty dishes, left to soak in some water before an AM washing, had all frozen into the dishpan’s block of ice. So they had to try and resolve that issue. 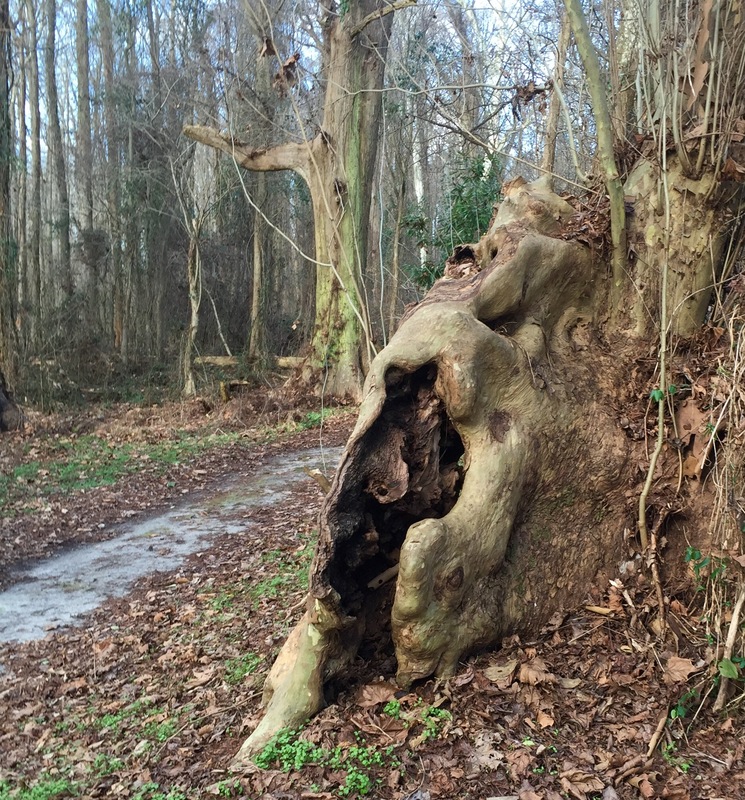 I took a very short walk and saw a really cool cypress knee right here in the campground. Finally, around 11A, we all packed lunch and hopped into Jack’s Subaru for a day away from camp (and warm in the car and in various visitor centers). 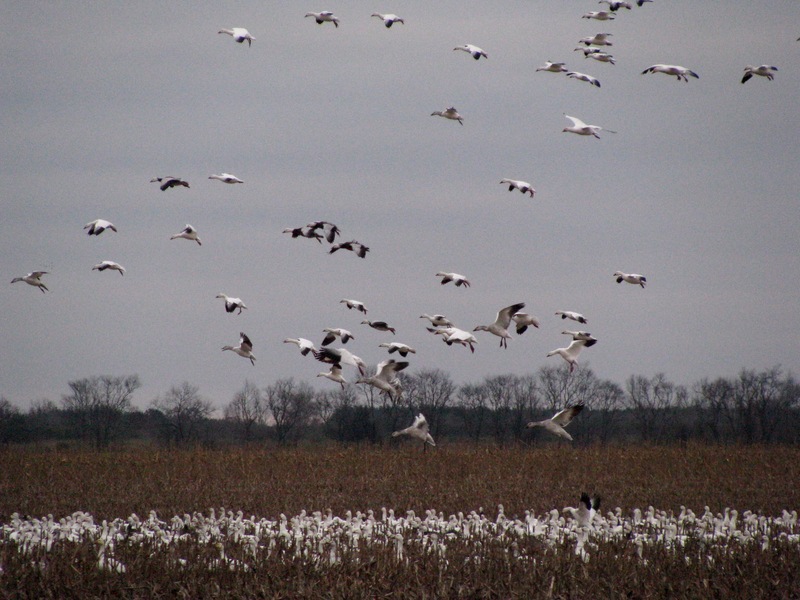 We’d heard that the best place to begin and to find the best wintering birds was Mattamuskeet Lake and the refuge visitor center there. While all the roads in this agricultural area appear to be straight lines, arranged in squares around stubble fields and paralleled by canals, there is no straight line to follow that will get you from Phelps Lake (the one nearest us in Pettigrew State Park) to Mattamuskeet, to Pungo Lake. Very strange navigation in these parts. There’s a major road crossing the width of Mattamuskeet, and with the rains, only a foot or so above the waterline when we drove it. Cypress islands were heavily under water, and the wind was fierce, so there were exactly zero water birds visible on or in the lake. We thought we might see a bald eagle or so, but all I saw were songbirds in the grassy and thicket-y areas along the drive. There were probably more species that we were unable to identify. I’d hoped to see some wood ducks and mergansers but they were not there while we were. It was very fun, and there was a helpful information sign right there to help us figure out what we were seeing (Barbara had also brought a book [I forgot mine] but our hands were so cold we didn’t try to use it until we got back into the car). 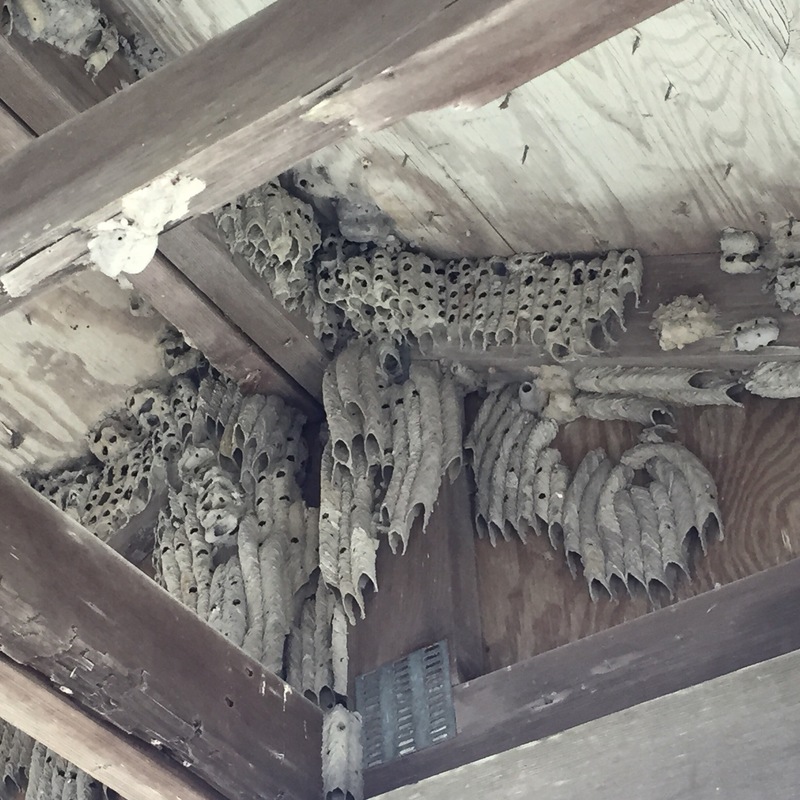 Under the roof of the info station signage we looked upwards to see a symphony of architecture built in the rafters over many years by mud daubers. It was rather incredible. Finally, the wind won the endurance contest and we all jumped back into the car to thaw. The visitor center was farther down the road and offered more info about the lake, the refuge and the wildlife to be found there. A very chatty volunteer helped us with navigating around the refuge, pointing out where we could and would be unable to go along the Matamuskeet refuge road system, and also gave us a map for Pungo Lake — a bird watching stop we wanted to include if possible, due to a recommendation from our friend John — and Pocosin (?) Lake. There was no Visitor Center at Pungo, but he said there were refuge employees there from whom we could get information about sightings and road closures, etc. We had our doubts about whether we’d be able to find anyone to speak with, because he named the only structure there a maintenance shed. He also showed us a listing of Mattamuskeet’s most recent species count and it was quite impressive (from the prior week). 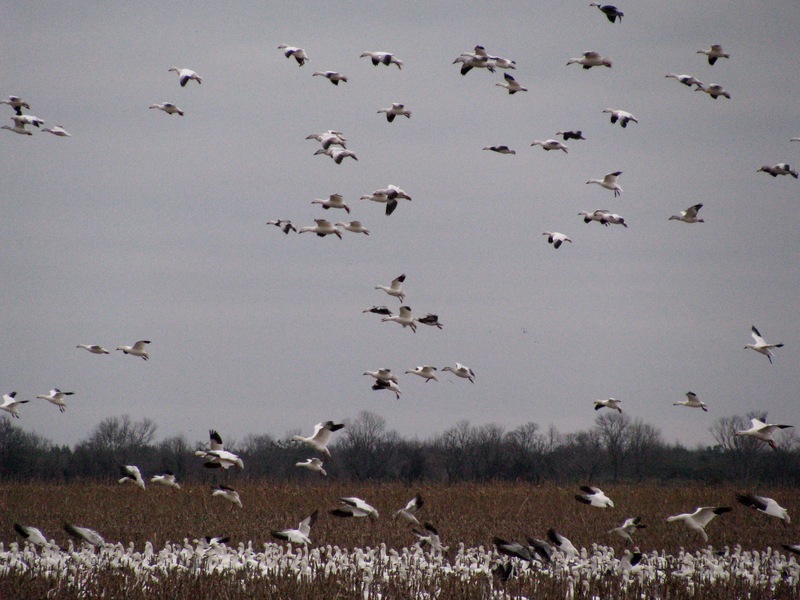 Some of the numbers were in the very high thousands — e.g., 6000+ snow geese. 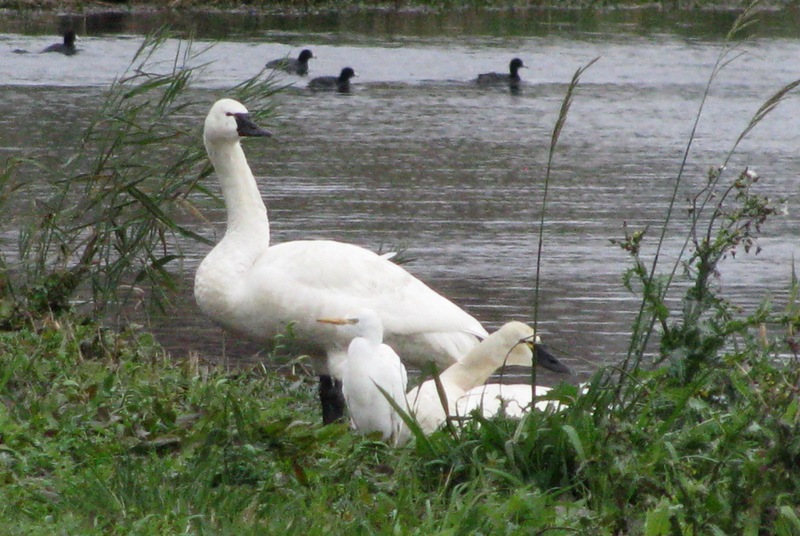 We drove out past some of the impoundments he recommended (after watching the “about the refuge” movie and seeing all the displays), and we saw many more Tundra swans, but we’d yet to stumble upon snow geese. 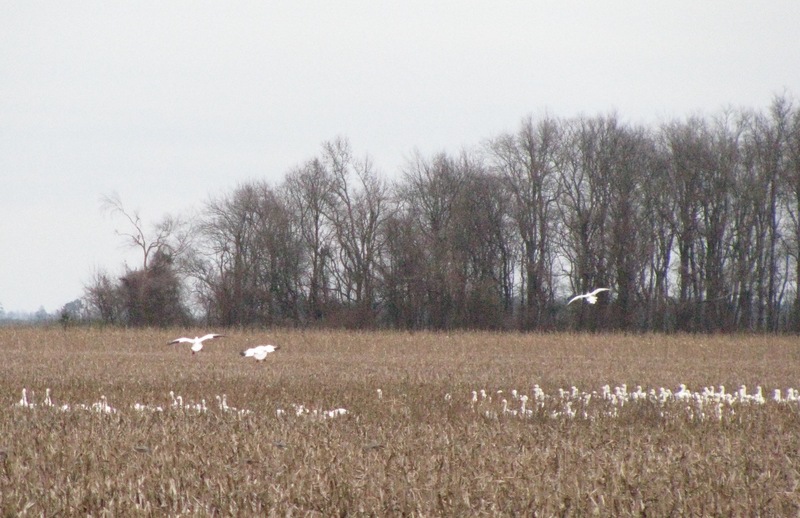 Nor had we seen any bald eagles except a couple feeding on carrion beside a perpendicular road we were passing along our wanderings; and one or two that were standing in a very wet agricultural field (this is a see-growing area, evidently, and we also saw the remains of cotton). But we saw one or two juvenile redtailed Hawks, many American kestrels, and about 5 marsh hawks cruising the territories for lunch. Speaking of which, we were getting hungry, and our plan was to go to one of the recommended/researched oyster bars for dinner, so we didn’t want to wait too long to eat our picnic lunches — but it was wicked cold in the wind, and there was exactly zero shelter (except duck/goose hunting blinds). Eventually, taking one of the recommended refuge drives along what the map called an escape canal, we saw a couple of green herons and more egrets, and then tucked our car into a copse and broke out the sandwiches. After that, we had one more recommended path to an impoundment by the Mattamuskeet VC volunteer, but it turned out to be a walking-only path, so we decided to head to Pungo. On the map it didn’t look so far away, but (of course) there was no straight line to get there, so it took a while. En route, we drove past this beauty sitting majestically on a vine-covered snag, and had to turn around to see if there was a photo to be captured. 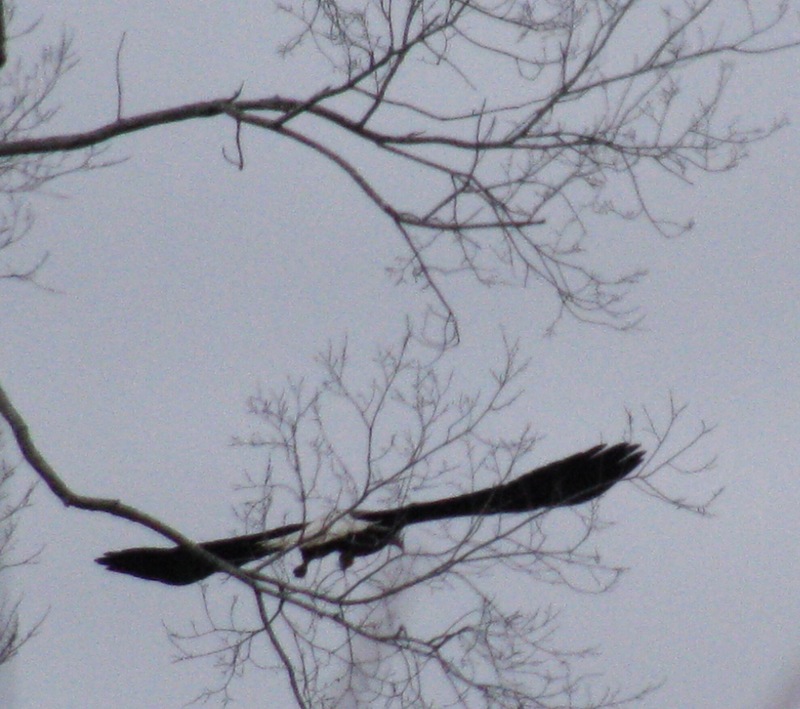 I couldn’t get my camera organized until the moment it took off from its perch, but I thought it was a moderately good pic, as you can clearly see the white tail, so I’ve included it here. 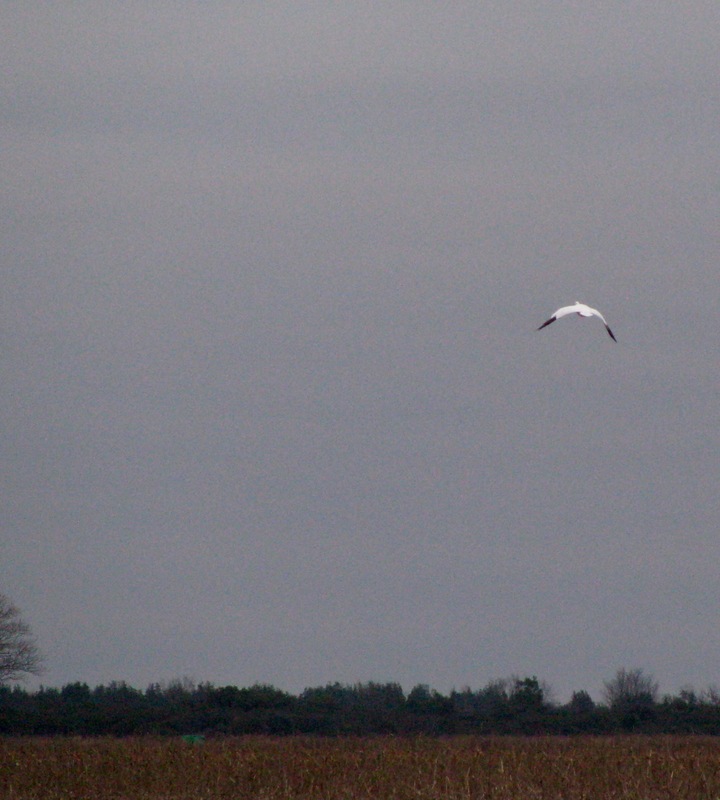 One more bird we were hoping to see, checked off the list. Yay. 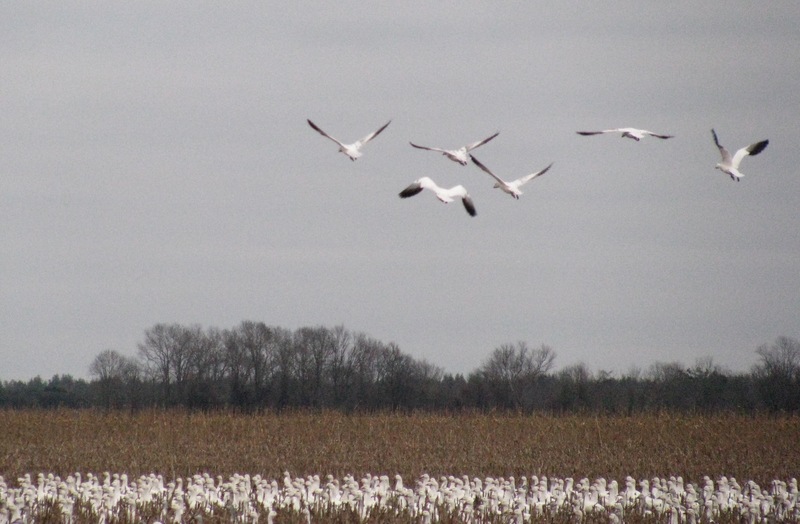 Now for the snow geese. 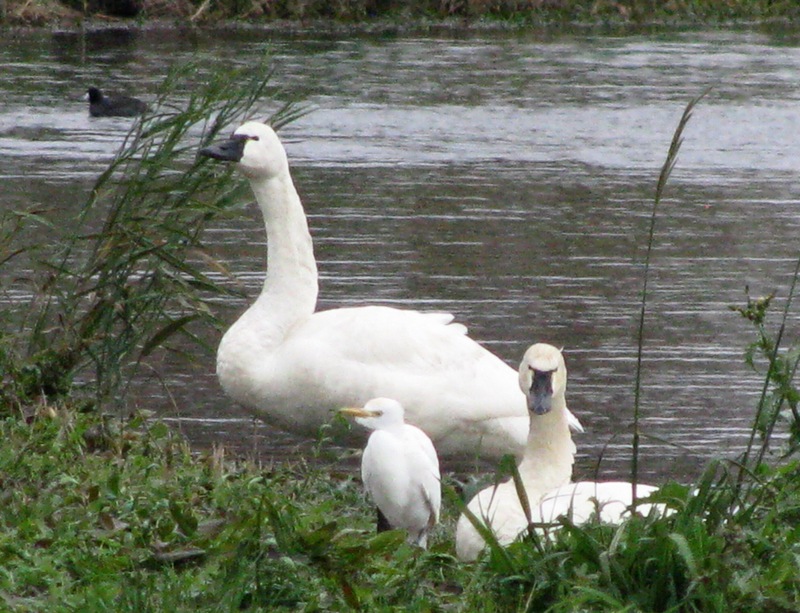 Both Barbara and I had imagined, when thinking about this trip, that the swans would be the difficult-to-find species, where we thought the snow geese would be as common as the Canadas. Fooled us. 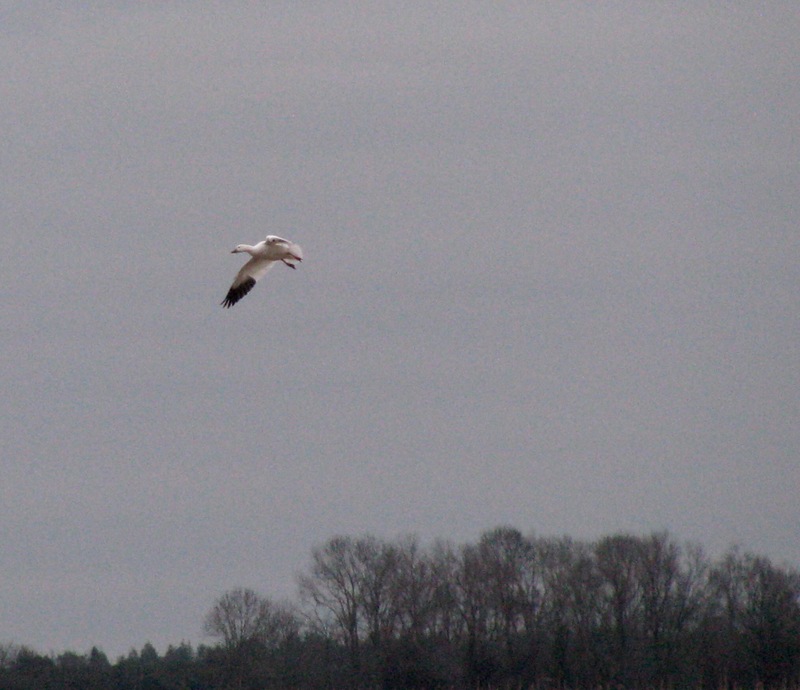 We were just about to head north along the western border of the Pungo Lake area, when I realized that the road the visitor center volunteer recommended was to our left, headed toward the southern border of the lake. So we turned around and found the maintenance shed, all under construction, and began bumping along the sandy, rutted roads toward the lake (again, carving right-angles in the geography as we sectioned our way closer). Damage caused by the excessive rains we’d all experienced was clearly evident along the roads in all the refuge areas we had traversed. Soon a truck approached, and as we moved to the side to let it pass, we noticed it was a refuge employee, and she waved us down. By this time it was about 3:30P. With the overcast, it really appeared to be getting dark fast. 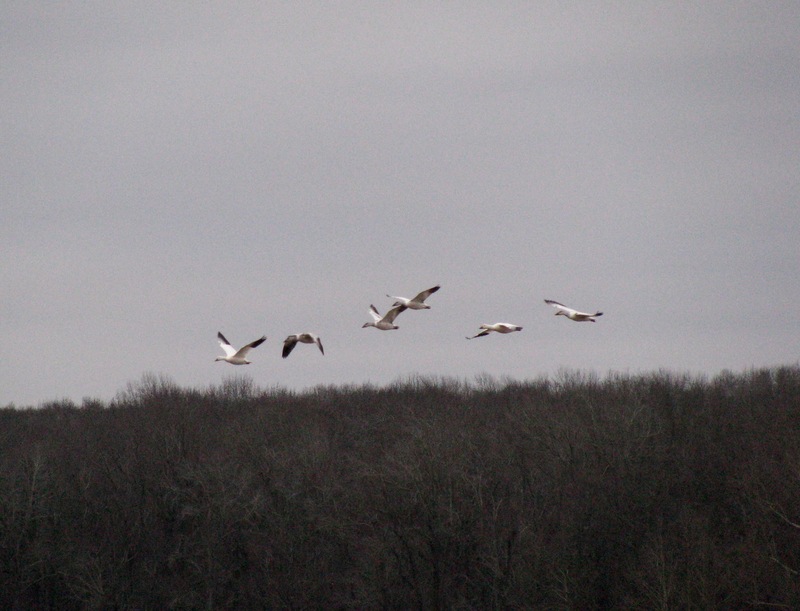 So we raced (faster than we probably ought to have over the sandy pot-holed roads) to where she directed, and we finally saw snow geese. 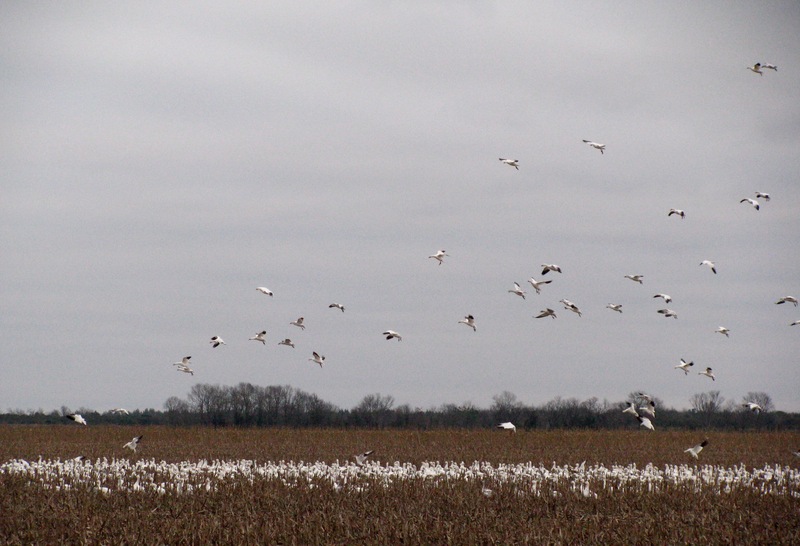 Lots and lots of snow geese. And they were in a stubble field, not an impoundment. We hopped out of the car and saw these footprints in the sand. 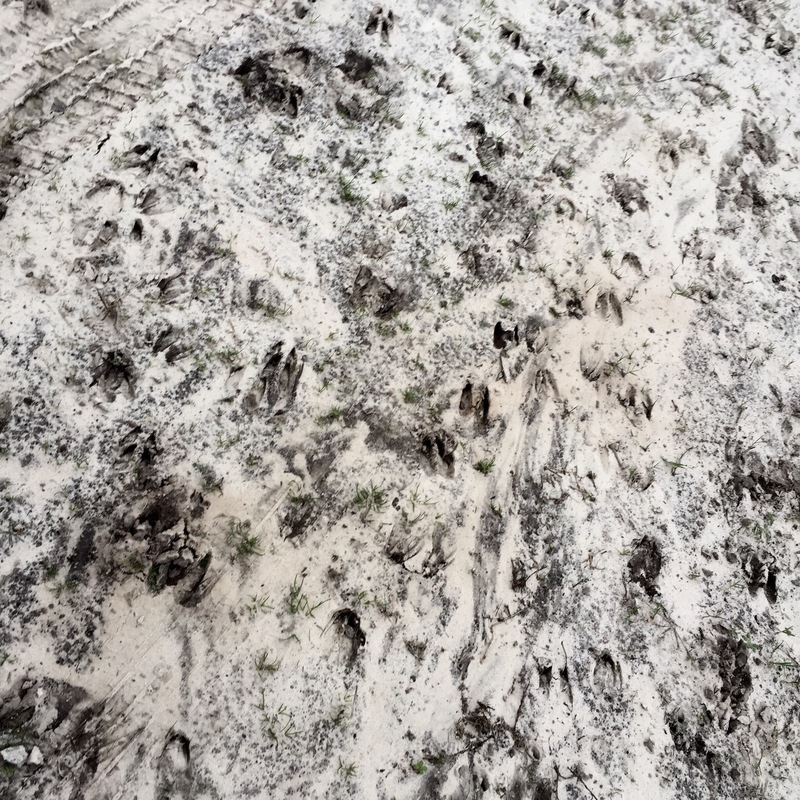 So many deer had passed by here not too long ago, and made an interesting pattern. So thought I’d take a pic. 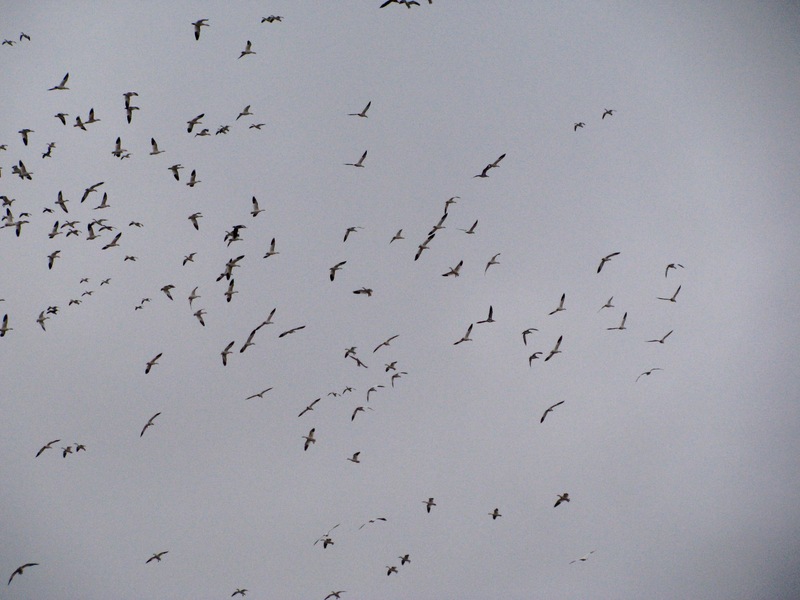 We walked along a “closed to traffic” road to see if we could get closer without spooking them, and while there didn’t seem to be anywhere near 10,000 birds, there was a big bunch and they were making a lot of noise. I took a lot of photos before a huge gang came calling from somewhere to our right, and the caucaphony grew. It looked like this new bunch might have made the numbers approach 10,000, and at first, they appeared to want to join the gang on the ground. They were circling around and getting lower, when suddenly everyone on the ground decided to take off. At this point, the noise level rose with the birds taking off and everyone mixing and circling over the field, gaining height, circling lower, then rising again. It was so totally breathtaking and spectacular I have no words to convey what we were witness to. 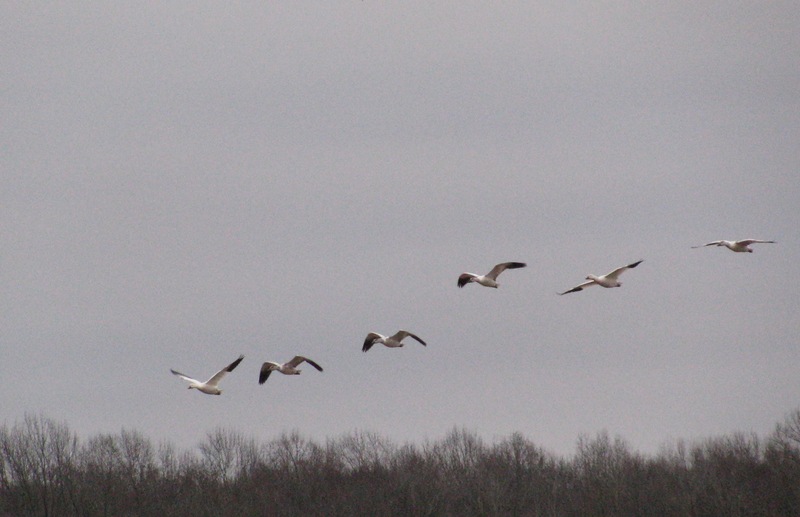 I about the time the first ground birds took off, I shifted to video and about 6 minutes later, the two groups had mixed, and were circling higher and higher, and finally all headed off over the trees and away from the field. It was like they had to come to some sort of consensus about whether to stay or to leave. I haven’t been able to access the video I took on my camera, and I’m hopeful that once I get it to my desktop computer, I’ll be able to manage it and put it into a form I can share. Because that will be the only way you can get even a small sense of the incredible spectacle we saw. Wow. Some of the stills will offer a hint. It was getting dusky looking at this point, and we drove away, satisfied and in awe. Headed toward a recommended oyster bar in Cresswell, but discovered (once we had a cell signal) that it was closed on Tuesdays. So we headed to another spot that looked promising and also served adult beverages. Had a “meh” meal with very ordinary beer and wine in a place that was overrun with locals who were very loud indeed. Got back to Roomba and had a final “real” beverage with our friends, and all hit the hay early and totally satisfied with the day, even though the seafood was only marginal. Who cares about fits anyway. This was a day of birds, and what a day it was.